No longer relegated to hospitals, they have taken the world by storm. People of all age groups report sleeping better, feeling better, and enjoying a bed in which they can read, sleep, work, and watch television in comfort. It seems too good to be true: alleviate major medical problems such as poor circulation, arthritis, and diabetes and score a massage all from your bed? Welcome to the wide world of adjustable beds. Today, you can turn many standard mattresses into an adjustable bed simply by upgrading the standard foundation to an adjustable lifestyle power base. Lower back pain: Adjusting the bed up or down redistributes the pressure across your body, which can help alleviate lower back pain. Additionally, you can actually stretch your back from bed, by positioning it upright and slowly lowering it down. Heartburn & Acid Reflux: Elevating the head while sleeping helps the stomach retain acids that might otherwise travel up the esophagus and cause heartburn. Diabetes: While an adjustable bed cannot cure diabetes, it can provide relief from some of the side effects of this disease. For example, diabetes can cause poor circulation, particularly in the legs. Elevating the legs during sleep can alleviate this condition. Asthma: Sleeping in a slightly upright position takes stress off of the lungs, which can help those who suffer from asthma or sleep apnea. Arthritis: Painful rheumatoid arthritis can be comforted by regular therapeutic massage. Many adjustable beds are equipped with massage functions that provide relief when you need it. Health benefits aside, adjustable beds are now associated with luxury. While they appear like a standard bed (and can be paired with frames and linens to suit your style), they offer so much more. Reduce or eliminate snoring: Your sleeping partner will thank you. Raising the head of the bed seven degrees can eliminate snoring by supporting your spine and respiratory system. Read, eat, and watch television: Stacking pillows behind your back is a short-term fix when you want to read or watch television in bed, as they constantly have to be fluffed and readjusted for comfort. An adjustable bed allows you to sit upright and offers more spinal support and comfort than pillows. Massage: The benefits of regular massage are countless. It reduces stress, lowers blood pressure, and relieves tension headaches and eyestrain among many other advantages. With some adjustable beds, you can gain these benefits with a nightly massage that will also prepare you for a more restful night’s sleep. Zero Gravity: You’ll have to try this feature in-store to fully appreciate it, but most adjustable beds now have a “zero-gravity position” that makes it feel as though you’re sleeping on air. Couples Comfort: You want to stay up late into the night, finishing off your latest mystery novel. Your sleeping partner has an early meeting and needs to get some shut-eye. Some adjustable beds let you both have your way with each side operating independently. An adjustable bed is an investment that can change your life. When you sleep better, you feel better and perform better. There are just a few things to keep in mind as you prepare to upgrade to an Adjustable Lifestyle Power Base. 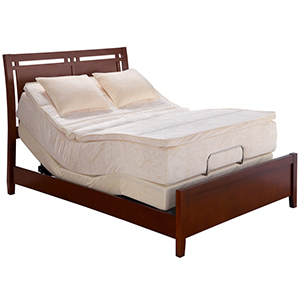 Adjustable bases pair with a variety of mattresses, including memory foam, latex, and even some traditional coil mattresses. Be sure to find the mattress that will best suit your body type and sleeping style prior to choosing an adjustable base. It is important to test the adjustable base before making a purchase. Each model offers different capabilities. Talk with a salesperson to find the right one to suit your needs. You’ll also want to make sure the base does not emit any squeaking or other noises during movement. The more bells and whistles a product has, the more that can break. At Slumberland, we only carry adjustable bases from reputable companies such as Tempur-Pedic that are durable and long lasting. Do your research and make sure the base you are considering is made from heavy steel and the rollers from an indestructible material such as metal or nylon. Make sure you understand the product warranty before purchasing an adjustable base. The warranty should be comprehensive and offer technical support for at least one year. Don’t assume the warranty covers everything. An adjustable bed has a lot of moving parts—they may not all be covered under the warranty. Ask your salesperson to spell it out.